Do larger numbers of N count? Higher N - like 4 gluons or a glu4on - cost more energy, available by e.g. high impulse or highly excited internal state. The higher N is, the more energy is needed to realize the situation and the lesser number of contributions can afford that. The wavefunction-contribution of higher N suffers of energy-reduction. So the answer seems to be no, in (nearly) groundstate possibilities of higher N don’t count. The larger the environmental energy, the higher N counts too. In N-conversions 1 --> 3 and 3 --> 1 are the main processes. (Only N is given here, each number is a spin1 gluNon). Every time a gluon splits in 3 one gets one pair of gluons extra. Every time 3 gluons merge one loses one pair of gluons. If it wasn’t for the energy all spin1 gluNons with odd N convert easily to each other: 1 --> 3 --> 9 --> 5 --> 1 and so on. An even number of gluons never add up to spin +1 or -1. The spins of 4 gluons sum up to -4, -2, 0, +2 or +4 and none of them are gluon-like. When in a first step a spin1 glu2on has come to existence, each of its 2 gluons can easily go 1 --> 3. When only 1 gluon does this, one obtains a glu4on. When both gluons do so one obtains a glu6on. When in a next step another gluon goes 1 --> 3 one obtain a glu8on. And so on. All even-N spin1 gluNons convert easily to each other as long as the environmental energy can effort it. In general the merging of an odd number of spin1 gluNons will be easy, while the merging of an even number is more difficult. A spin1 gluNon rather absorbs 2 other spin1 gluNons than only 1. A spin1 gluNon more easily splits in an odd number spin1 gluNons than in an even number. A spin1 gluNon rather emits 2 spin1 gluNons than 1. Spin1 gluNons can also merge and split easily without the total number of gluons changing, like 9 --> 5 + 3 +1. And 9 --> 6 + 2 +1? Here two even-N spin-1 gluNons arise. If they get opposite total orbital impulse momentum, will this work easily? In fact, when energy is no restriction a gluon always sets off as a superposition of all N.
via , and to . Collisions between a glu36on (try - no don’t try! - to imagine the impulse momentums between those 36 gluons) and a glu15on have to be considered. 25 gluons can merge into 1 gluon. Any gluNon can always emit or absorb any glueNball. And so on. It might be that in near-groundstate at any moment there is at the most 1 maybe 2 sole gluons in the baryon. But the situations created in our ever larger particle accelerators offers environments of ever higher energy. Let’s suppose this energy is sufficient for 1 gluon to come to existence and make that 1 gluon one time to split in 3 gluons. 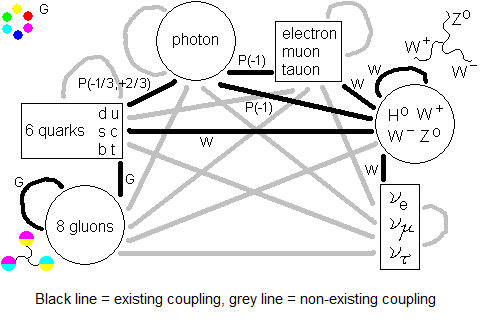 Then the whole scheme of “Three gluons emitted simultaneously” in the previous page is applicable, as well as the table in this page under “Can 3 gluons change into 1 gluon easily, N going 3 --> 1?” Once again I wonder if we didn’t mistake the gluons we use for analyzing our particle collision results for glu3ons, or at least just 3 gluons for each gluon we use now.